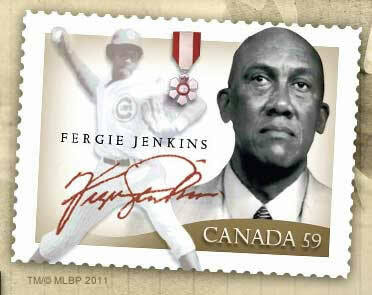 Fergie Jenkins has had an illustrious and memorable career. His ability to control games and nullify opponents led to him recieving many awards during and after his career. Some of these include the: 1971 NL CY YOUNG AWARD, 1971 SPORTING NEWS PITCHER OF THE YEAR, 1974 AL COMEBACK PLAYER OF THE YEAR and him being selected as an All Star in three seasons. Becoming the first (and only) Canadian in the National Baseball Hall of Fame in Cooperstown, N.Y.
Fergie: "Being given a star on the Walk of fame was incredible. I mean being surrounded by people in music,film, television and sports is quite an honour. Having the best of the best Canadians being all around you cemented in stone . . . that's special. I was nervous at the ceremony and now just think hundreds maybe thousands people walk over me every day (laughter)." Fergie: "I played some of my best years in Chicago. The fans were always amazing and supportive . . . best fans in baseball I would say, most patient too. I played with some great guys during my time there: Ernie Banks, Billy Williams, Ron Santo and Ryne Sandberg to name a few. To have the Chicago Cubs organization recognize me as one of the best and retire my number . . . that was truly an honour." Fergie: "Being recognized as being the best at what you do or one of the best at what you do is something that only a few people get to enjoy. But, being recognized for that and being the only representing your country . . . that is something special. The most special part of the induction was that my father was able to be there to witness it, he himself was a great ballplayer and a great Canadian so the honour was his also. I am a proud Canadian and being inducted as the first Canadian means alot to me . . . I hope to be joined by many more in years to come." Fergie: "When I was told that I would be receiving the Order of Canada I was awestruck. It is the highest honour that any civilian can receive. As I said, I have always been a proud Canadian, in a sport with few Canadians I considered myself one of the best, but to be honoured as one of the greatest Canadians amongst Canadians . . . that is the greatest honour that could ever be given, not just to me but any Canadian."